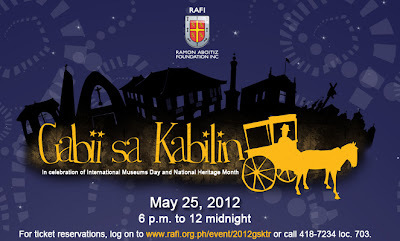 I finally landed on tickets for Gabii sa Kabilin (Night of Heritage) which will happen on the 25th from 6pm to midnight. Ticket is sold at Php150 each which includes all access to the 22 participating heritage sites in Cebu and Mandaue area, as well as rides on event designated buses and one tartanilla (horse-drawn carriage) trip in the old district of Cebu City. To get tickets, you can go to Ayala Center Cebu at the concierge or head out to any of the participating sites. Selling period is from May 3 to the 25th. This annual event is now on it's six year run and is initiated by the RAFI Culture and Heritage and its partners in the government and private sectors.